Drag my sewing machine out of its current hibernating place, to which it retreats when I have guests staying in the guestroom. Measure anything (hey, feeling crafty doesn’t necessarily mean I’m not feeling lazy). Make anything I could possibly screw up. There were a few “no-sew” tutu tutorials I found online, but most of them were *mostly* no-sew (which is to say, I would have had to sew the waistband. Didn’t want to.) In the end, I drew inspiration from these tutorials, but went it alone where it came to the waistband. I also took some chances that worked out well in terms of doing the whole thing without the assistance of a tape measure. The other cool thing about the way I made the tutu is that it has about 3″ of potential for letting-out in the waist, which means it will fit for a longer period of time. I’m so happy with the way the tutu turned out that I wanted to share the project. I figure if I can make this thing with one-and-a-half arms while I’m hopped up on pain pills, anyone working with a full deck and two hands should be able to whip it out in no time! (BTW, if you’re a fan of no-measure DIY, I have a new tutorial for a gorgeous, easy mermaid costume. It’s not no-sew, but it requires only very basic (like, a few straight lines) skills. 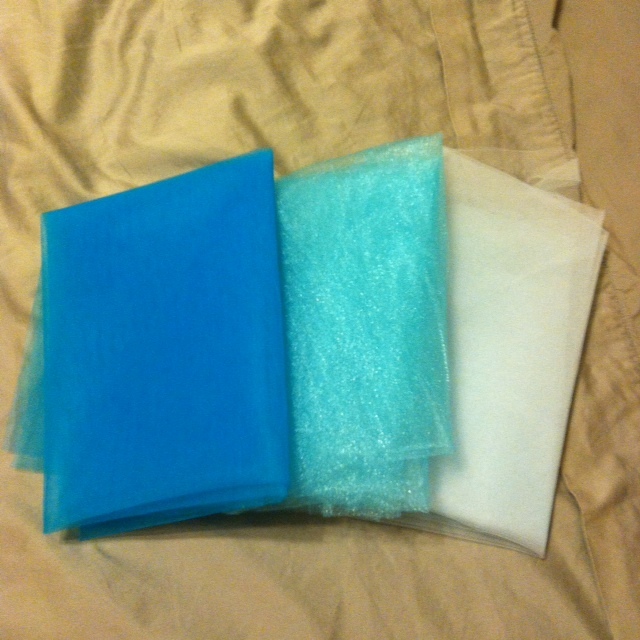 I probably shouldn’t have photographed the blue tulle against sage green sheets; the colors are way off. Next, I eyeballed my kid. From the top of her waist to her knees is about the distance from the tip of my pinkie to the tip of my thumb with my fingers spread (which happens to be 8″, but that’s unimportant). I figured I wanted the tutu to come more or less to her knees, so I decided to cut strips of fabric that were just a bit longer than twice the distance from my pinkie to my thumb (no measure, get it?). It turned out that by folding a yard of fabric in thirds, I got strips that were 18″ long by about 60″ wide (again, I didn’t measure, but I am providing the measurements here so you’ll know what I was working with). I then cut strips that were “about the right width,” meaning (to me, given my mood at the time) about 5-6″. Again, I didn’t measure. Actually, what I did (to get semi-even strips without measuring) was take my 18″ x 60″ strips and cut them in half to 18″ x 30″. I then cut those in half to 18″ x 15″, and I cut each of those into (more or less) thirds, at 18″ x 5″. Close enough. To measure “half,” I folded the tulle in half and cut along the fold. To measure “thirds,” I just eyeballed it. Tulle is super-forgiving. The other thing I love about tulle? 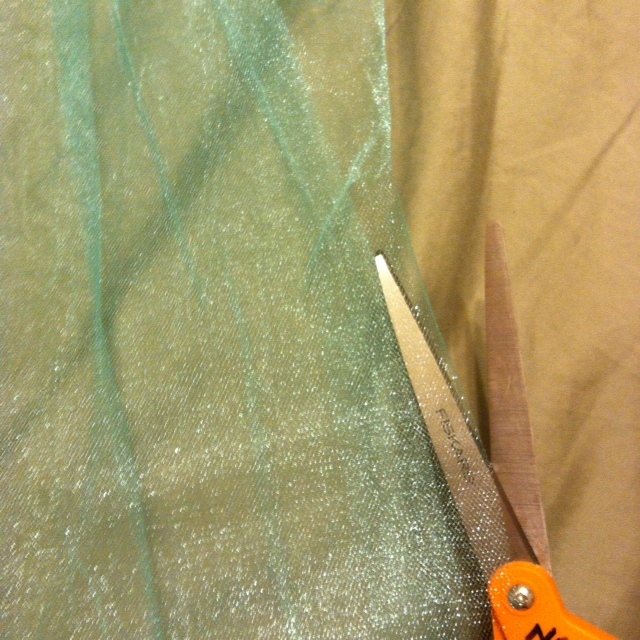 You can just sort of put an open pair of scissors along a fold and push forward, and the tulle basically cuts itself. When I was done with all this cutting of strips, I had three piles of 18 strips a piece, each strip measuring about 18″ by 5″. 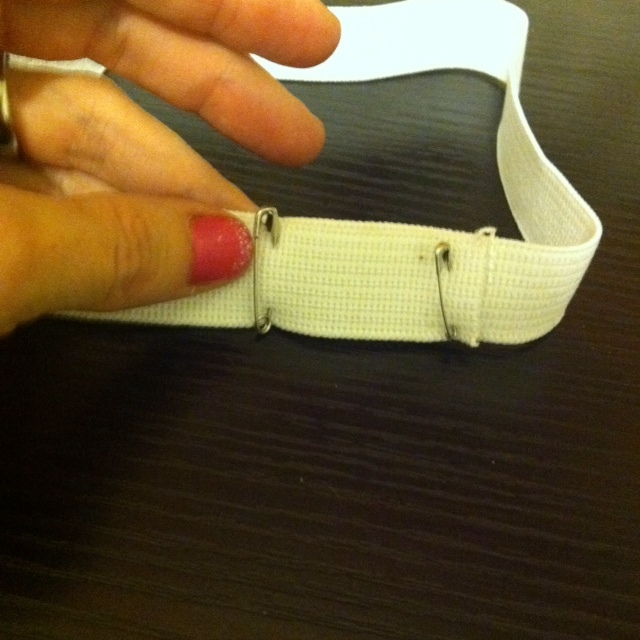 Next, I made a waistband out of some elastic. I used a pair of W’s PJ pants to eyeball the size of the tutu waist. Because the PJ pants were about as wide across (laying flat) as my hand, fingers outstretched, from pinkie to thumb, I measured approximately that much elastic (again, that’s 16″ for those of you who are keeping track). I then added about 3″ for overlap and room to grow. I secured the waistband with two safety pins, one near each cut end. The only important thing here is that the safety pins should not be longer than the elastic is wide (or if they are, you would need to put them in on the diagonal so that they don’t stick out). The cool thing about this is that with the pinned waist and overlapping elastic, there are almost 3″ worth of waist I can let out as she grows. 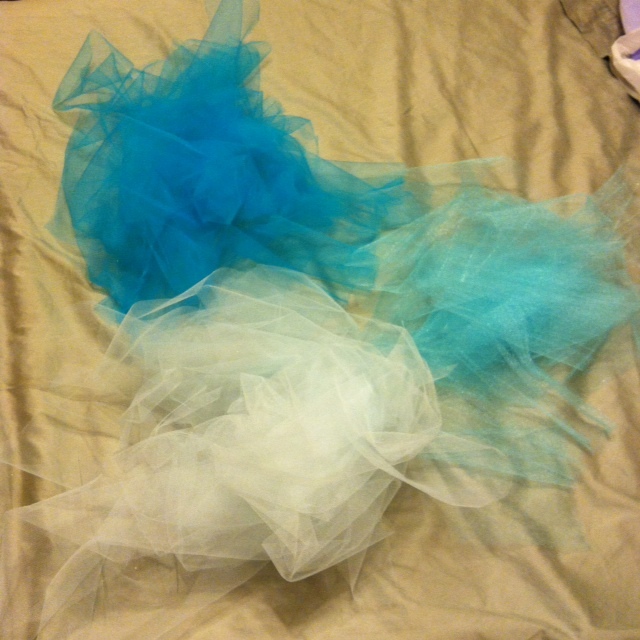 I don’t have to take the whole tutu apart to do this; I can just sort of scoot the nearby tulle to the side. You’ll see what I mean. You could use 3/4″ or 1″. Anything too much narrower would probably roll, and anything too much wider would be…really wide. This stuff is a couple bucks for several yards at Joanne. I then started attaching the tulle strips. Because this is a no-sew tutu, I just sort of looped the strips through the waistband and pulled them snug. It seemed to work best (and created a nice look to the tutu) for the loop to point down and forward. Fold the tulle strip in half, and insert it into the waistband with the fold (half-way point) pointed downward. 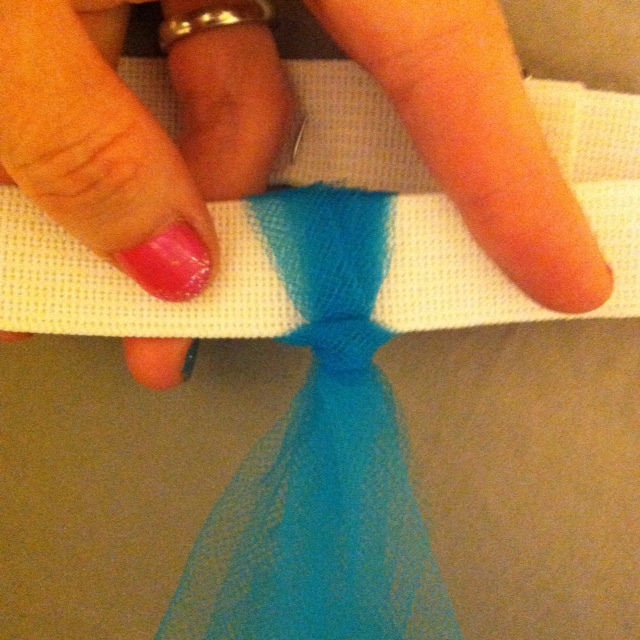 Push the tails of the tulle through the loop, and tighten. 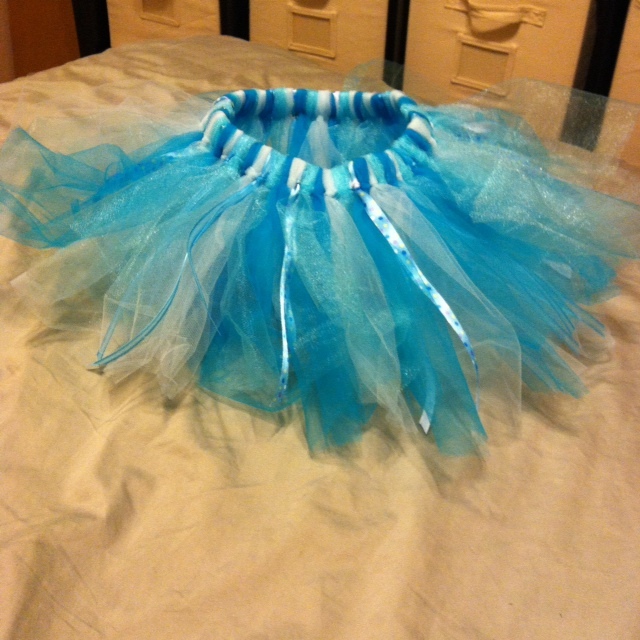 I added all 54 strips of tulle this way in an alternating color pattern. I got lucky; 54 strips at about 5″ wide each made a perfect, full tutu with a 16″ waist. If you’re keeping track, then, you should probably count on about a yard of 60″ tulle per 16″ of waist, or about 10 5″ strips per 3″ of waist. For reference, my (slightly undersized) kid is 15 months old…but you can do the math. Or, better yet, don’t do the math, and just keep cutting and adding strips until it looks right. I would advise 1.5 yards of tulle for an average 2-year-old (remember, my kid is teeny), and closer to 2 yards for a preschooler. Of course, you’ll need to err on the side of increased yardage if your tulle is narrower than 60″. 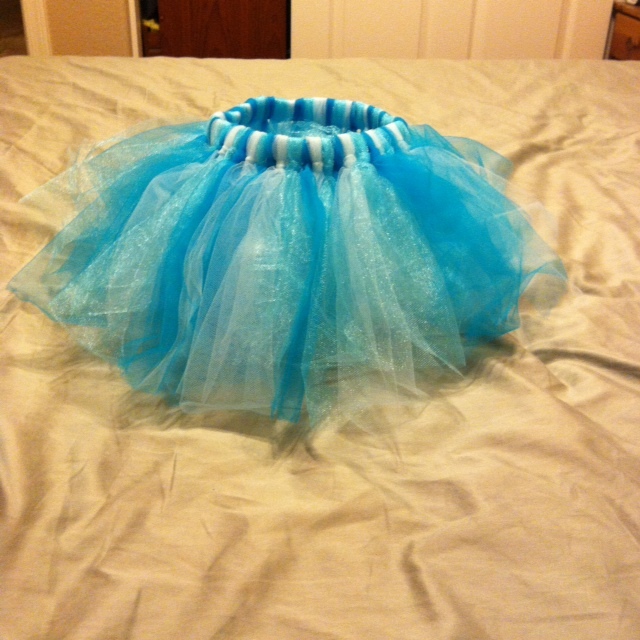 Here’s my finished tutu. All told, it took me about an hour. One trick with the ribbons; they’re sleeker in texture than the tulle, and they don’t “grab” as well, which means the loop trick for attaching them doesn’t hold them as firmly. I scooted the two adjacent tulle pieces to the side when I attached each ribbon, and then scooted the tulle back in place so it almost covered the ribbon attachment point. This helps hold the ribbon in place. Another idea I had (but didn’t do, because I wasn’t this motivated): you could use some of the tulle to make streamers, which you could attach to a dowel (along with the ribbon) to make a matching wand. CUTE! Anyway, can’t wait to surprise W when she wakes up. What do you think of my TRULY no-sew tutu? That,s really cool. My five year old could help make one for herself. Nice one. Glad your shoulder is on the mend. I had seen some similar no sew tutus around, and like the idea, but have not tried it. Your story about the tule/mosquito net resounds here too. I once bought some tule to make a home made mosquito shield for my husband’s face. It worked! He hates going into the fabric store too. Yeah, I’ve seen several similar ones online. Most that are no-sew have a ribbon waist (you tie them on). I like the elastic waist a little better, especially for a toddler. I’m hanging in there; thanks for asking! Thanks! The tutu is so cute and easy enough that my three year old can help. I know what we’ll be doing the next rainy day that comes our way. Ooh…I love the idea of doing this as a mama-and-daughter project!! Thanks for the help on making a tutu. I do not own a sewn machine and wanted to make my daughter a fun tutu for her Mardi Gras birthday party this February. This one sounds so easy I am heading to JoAnn’s tonight to get the tulle and elastic to start my project. I want to make a tutu for myself. Thank you so much for the step-by-step for measure-impaired tutu-lovers! Hope your arm is much better by now. Good luck with the tutu! I’d love to see a picture when you finish it! One more tip: the tutu directions I gave make a relatively low-profile skirt that works well for toddlers and little kids. 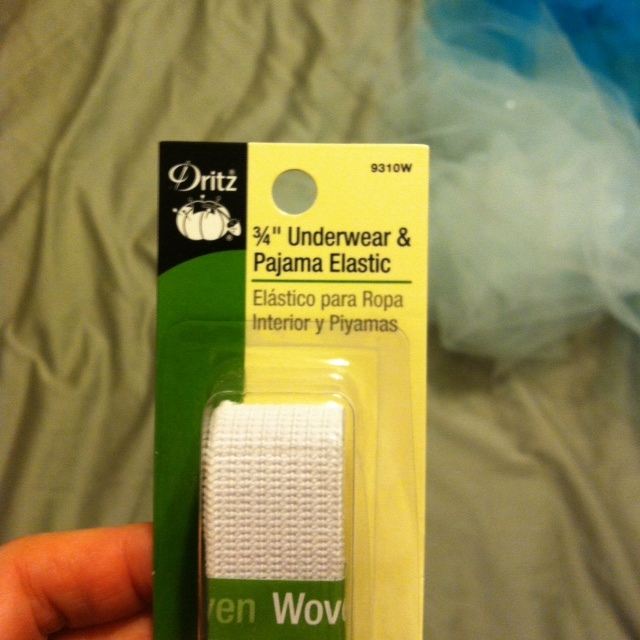 For an adult, if you want something that sticks out a little more, pack the tulle strips in with greater density! Thank you so much for these instructions! I’m looking forward to trying these out for myself – a costume for an 80s style roller skating party with my new job! Sew cute Tutu!Can’t wait to try it out! This is amazing. Will try today.